Heat oven to 375°F. Spray cookie sheet with cooking spray. Unroll dough into 1 large rectangle; press perforations to seal. Spread pizza sauce evenly over rectangle to within 1 inch of edges. Sprinkle with Parmesan cheese. Starting at short side, roll up rectangle, jelly-roll fashion. With sharp knife, cut into 16 slices. Place cut side down on cookie sheet. 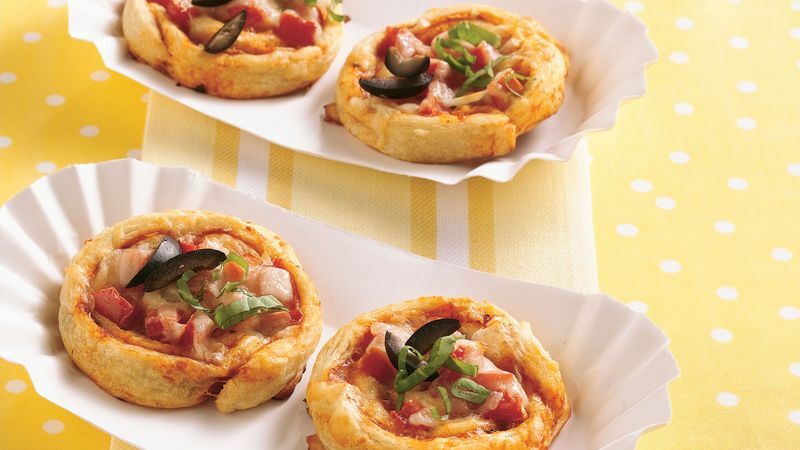 Top each slice with 1 tablespoon tomato and about 1 teaspoon mozzarella cheese. Bake 9 to 11 minutes or until edges are golden brown and cheese is melted. (Bottoms will be very deep golden brown.) Top with basil. As with any pizza, you can customize toppings as you like. Pepperoni, diced onions and sliced black olives all make for delicious snacks.